Students, parents, and teachers all enjoy the warm, fuzzy company of the fuzzFamily. It is no surprise that we get tons of requests for tips and tricks on how to make them. 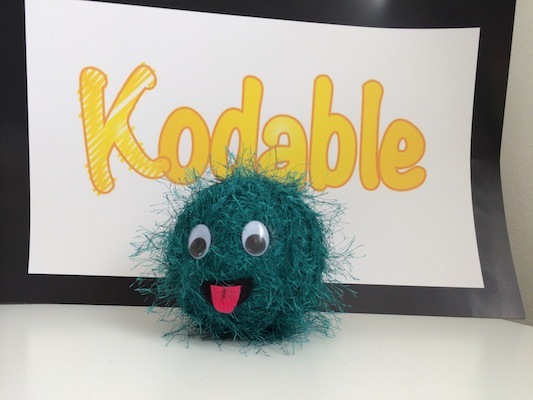 I decided to compile a list of all the ways you and your Kodable kiddos can enjoy a real life fuzz! I’d also like to give a special thanks to the awesome teachers who went above and beyond for their students and decided to come up with their own ways of making a fuzz. Their examples are included here as well. 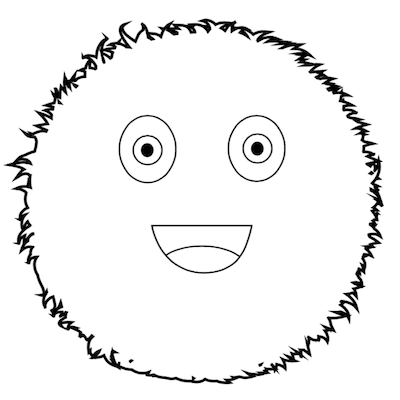 The easiest and most frugal way to create a Kodable fuzz is with our fuzz coloring sheet. Download the PDF and start coloring your own! 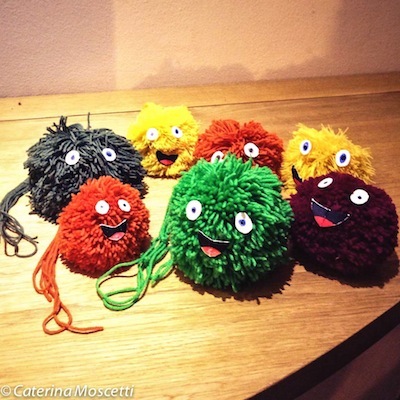 Thanks to Agnese Addone and Caterina Moscetti, the CoderDojo Roma students all got their very own fuzz! 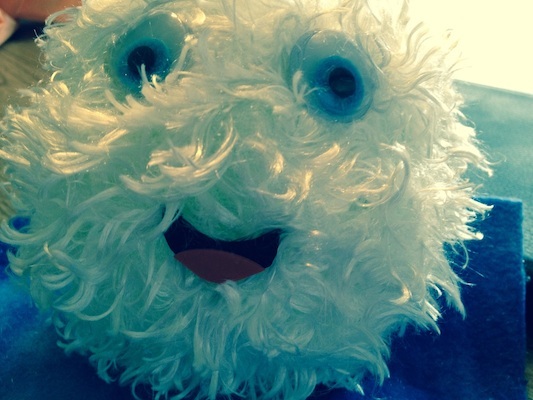 The pom pom fuzzes seem pretty simple to create. You can watch the youtube video or follow the steps listed below. Cut out two round pieces of cardboard. Make sure they are the same size. Cut out a hole in the center of both pieces that is the same size. You’ll end up with two cardboard rings. Wrap yarn around both pieces of cardboard starting by going through the center, like in the picture below. Keep wrapping until the entire ring is covered. 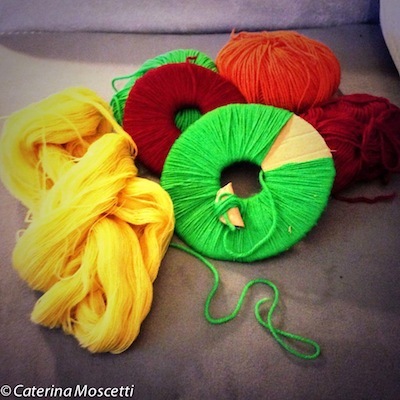 Cut each piece of yarn all around the ring using the two pieces of cardboard as a guide. Be sure to hold the pieces of cardboard securely while you cut, so they don’t come apart. 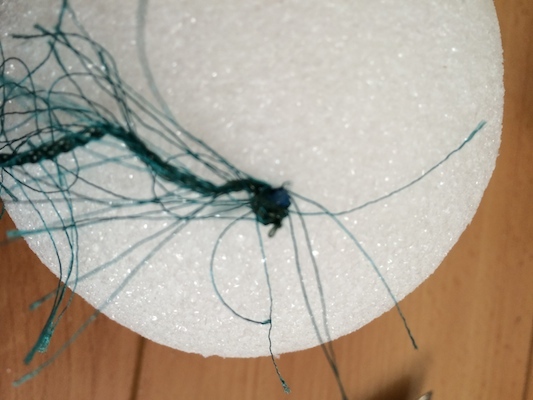 While the pieces of cardboard are still attached, wrap a piece of yarn very tightly around the center of the yarn ball. Tie it tight, and cut off the remaining yarn. 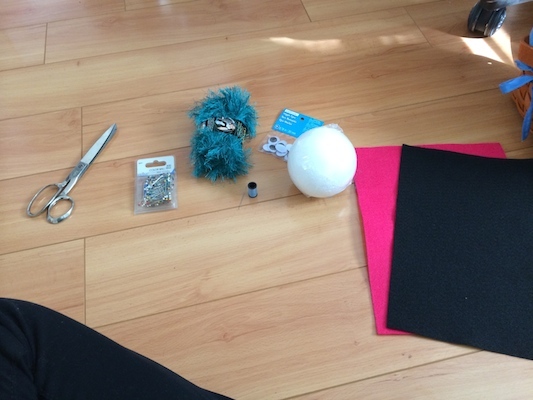 Remove the cardboard, and fluff the pom poms. 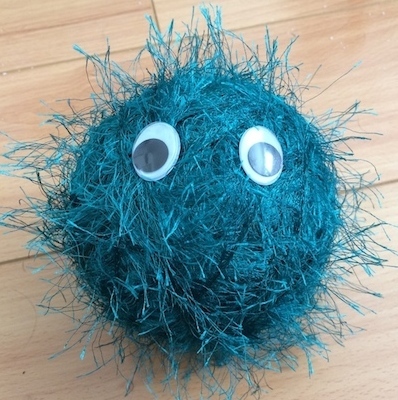 Add eyes and a mouth and you have an adorable pom pom fuzz! I was inspired by this tutorial, and decided to make my own fuzz to travel with us to schools, events, and keep me company at my desk. The supplies for the entire fuzz cost less than $10 at Michael’s. Once I had all of my supplies, it took me less than ten minutes to make blueFuzz. The original tutorial used hot glue, but I don’t have a hot glue gun, so I opted to use pins to secure the yarn instead. So far they have stayed very secure. 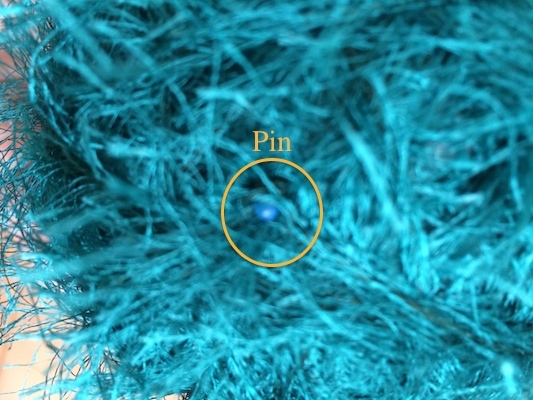 Stick the pin through the yarn several times, wrapping the yarn around the pin each time you “thread” it. Then, pin the yarn to the foam ball. 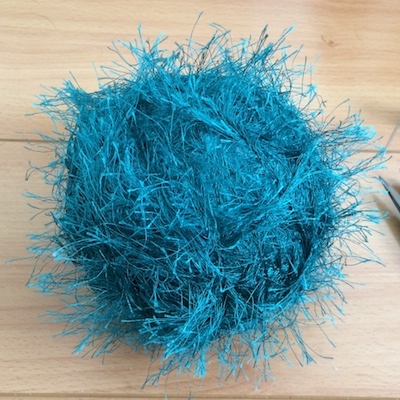 Wrap the yarn around the foam ball until you do not see any more white. Use the second pin to secure the end of the yarn. Be sure to “thread” the yarn more than once, wrapping it around the needle each time. Then stick the needle in the foam ball. This works best if the needle is the same color as the yarn, so it will not show. Glue on both of the eyes. You’ll need to hold them in place for about 30 seconds. Cut out the mouth and tongue. Before you glue or stitch them, hold them up to the fuzz’s face to make sure you’re happy with the size, shape and tongue placement. This took me a couple tries. Optional: I decided to stitch the tongue to the black mouth piece to give it a bit more definition. I started at the top of the tongue and used a dark pink thread. I back stitched so it was all one solid line. I stopped half way to the end of the tongue, so it will still stick out a bit. Glue the mouth on and hold it there for 30 seconds. Optional: Depending on which fuzz you decide to make, you may need to trim up the fur so it looks less frizzy. My blueFuzz still needs a trim, but I think he looks pretty good either way. This is the most realistic fuzz I have seen so far. Jeanne Reed and her daughter made diamondFuzz. I am very impressed at their creative talents! She looks fabulous. For more details take a look at Jeanne’s tutorial here.